TUDERTECHNICA, a leading European manufacturer of high-quality rigid mandrel hose, was founded in 1983 near Venice, Italy as Tubigomma Deregibus SRL. Over the years, TUDERTECHNICA has served the needs of clients around the world by developing a complete line of hose for a wide variety of industries including the dairy, brewery, cosmetics, pharmaceutical, and petroleum sectors. 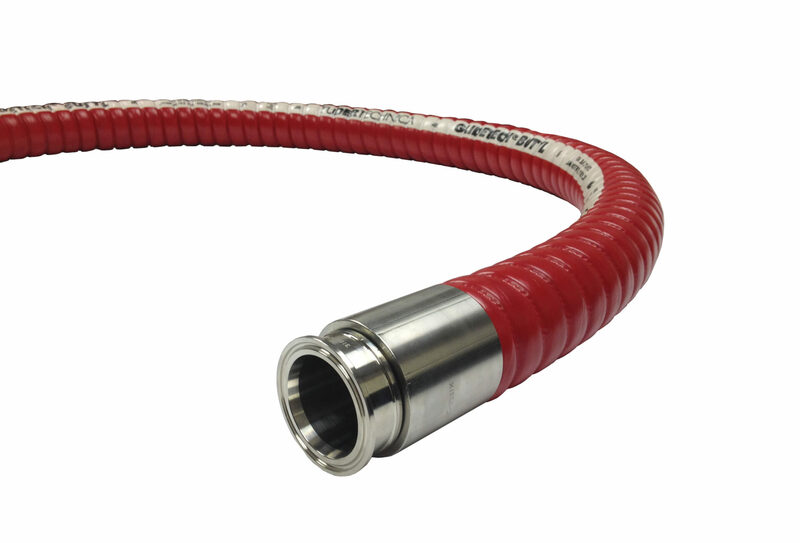 A true solutions provider known for its engineering expertise, TUDERTECHNICA can even custom build a hose to meet your specifications if necessary, in units up to 130 feet in length. Featuring new GLIDETECH® Technology covers. Built from the core out on a proprietary rigid mandrel frame, TUDERTECHNICA hoses for the Food & Beverage industry incorporate liners, plies, and covers chosen specifically for each individual application. All are phthalates-free and meet every applicable government food-safety standard in the U.S., Europe, and Japan — including a 3A Sanitary Standard Class II rating. Some benefits include Abrasion Resistant Cover (non-making in many cases) lasts longer, flexible design permits optimum bend radius for easier routing, easy to clean glossy cover, smooth bore tube and mold resistant. Built from the core out on a proprietary rigid mandrel frame, TUDERTECHNICA hoses for the chemical industries incorporate liners, plies, and covers chosen specifically for each application. Liners are available in PTFE,FEP,PFA,UHMW, and Silicone. The fully conductive hoses are conductive through both tube and cover, as well as utilizing a static wire. Some benefits include Ozone Resistant Cover (abrasion in many cases) lasts longer, flexible hoses that allow for easier routing and choice of liners specific to applications. Built from the core out on a proprietary rigid mandrel frame, TUDERTECHNICA hoses for the Cosmetic & Pharmaceutical industries incorporate liners, plies, and covers chosen specifically for each individual application. Liners are available in IIR, MFA, UHMW, FEP, PFA; plus the Platinum-Cured Silicone liner in our TUSIL series of hoses. Select hoses are designed for applications where static electricity can build up, helping avoid potentially dangerous uncontrolled discharges. Some benefits include Ozone Resistant Cover (abrasion in many cases) lasts longer, flexible hoses that allow for easier routing and choice of liners specific to applications.